In the the province of Grosseto, two of the long-range routes of Bicitalia’s national network intersect, the Tyrrhenian sea Cycleway and the Grosseto-Fano Two Seas’ Cycleway. Click on the lines for more information. 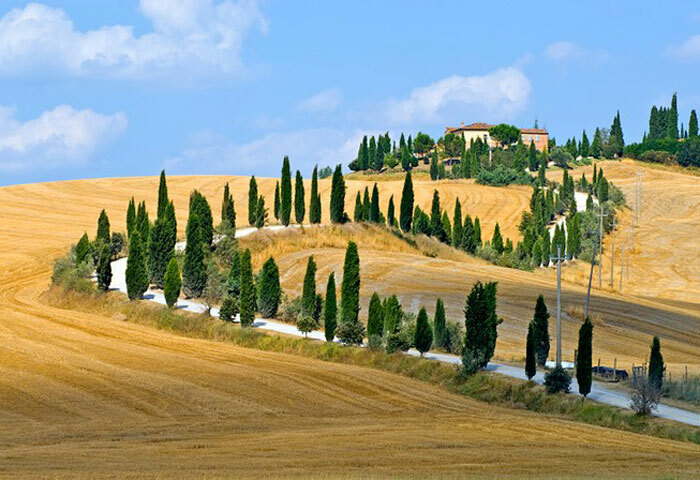 The Tyrrhenian sea Cycleway is a relaxed 317-kilometre tour along the coast of Tuscany using a combination of quiet roads and cycleways. Before Eentering Tuscany near Ameglia, the Moncenisio variant of the Ciclovia Francigena (iclovia dei Pellegrini) passes through Liguria from Piemonte. This is an excellent route on quiet roads which reaches the coast near Chiavari and then heads, more or less along the coast, towards the Cinque Terre and La Spezia. 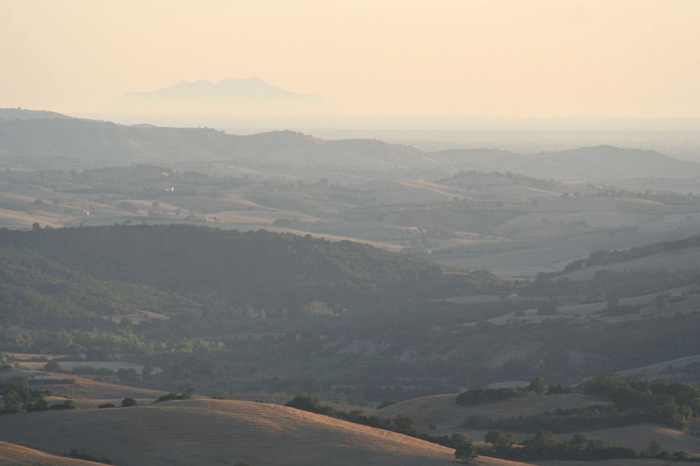 The Gran Tour della Maremma is a 405-kilometre circular route through south-western Toscana. The Grand Tour della Val di Merse covers a vast area, passing through the heart of the Montagnola Senese before arriving at the southern foothills of the Elsa and Cecina valleys, then rolling southwards to the Ombrone valley which briefly touches the Maremma Gros- setana, before going back up to skirt the northern part of the Crete, the magnificent gateway to Siena, a typically hilly territory characterised by a surprising variety of natural environments. L'Eroica is a vintage bike race which takes place at the beginning of October in Gaiole in Chianti in Tuscany, normally the first Sunday. L'Eroica in Gaiole. The Eroica is a classic born in 1997 to revive the myth of cycling and for the preservation of the last gravel roads, le strade bianche. The route is permanently sealed and consists of 110 Km of gravel roads out of a total 205 Km. 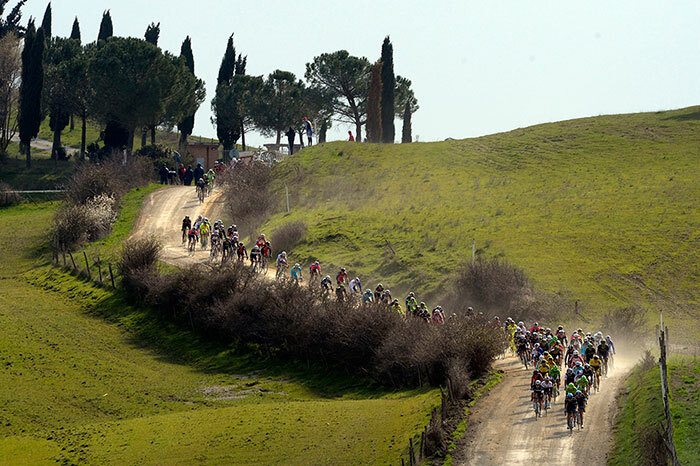 The Grand Fondo L'Eroica is one of Italy's most famous cycling events with over more than 4500 participants. During the weekend there is a fantastic historical bicycle market. Sentiero della Bonifica - In bicicletta lungo il canale maestro della chiana. For practical information about EuroVelo and this website please click here. The Italian National EuroVelo Coordinator's site provides a wealth of information about cycling in Italy. Further information on cycle tourism is provided on their 'Bicitalia' website. Italian only. Podere Santa Pia has been beautifully restored and overlooks a valley characterised by all the elements of the Tuscan landscape: vineyards, pastures, small forests, wheat fields, olive groves and downey oaks. On a clear day you can see as far as Corsica to the south.